IntEdgPerf is a new benchmark for running machine learning algorithms on embedded devices. It was developed at the Institute of Embedded Systems (InES) at the Zürich University of Applied Sciences. IntEdgPerf is a framework that allows a fair comparison between different embedded processors that can be used for executing neural networks. The area of embedded AI is a quickly emerging market where many hardware manufacturers provide accelerators and platforms. So far, metrics and benchmarks provided by the manufacturers are not usable for comparison. IntEdgPerf incorporates a collection of multiple TensorFlow AI models. It measures the time for the computations of the machine learning algorithm on embedded devices. The benchmark is dynamically extendable by allowing new machine learning models to be integrated. Hardware specific calls can be implemented as modules and integrated in the benchmark. 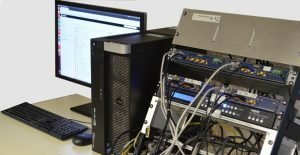 The benchmark was verified on multiple processors and machine learning accelerators such as Nvidia Quadro K620 GPU, Nvidia Jetson TX1 & TX2 and an Intel Xeon E3-1270V5. 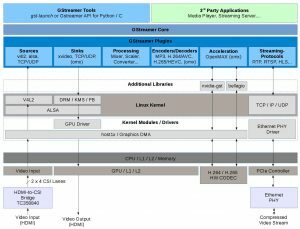 Also hardware accelerators, without a direct interface to TensorFlow, such as the Intel Movidius Neural Compute Stick were benchmarked. All tests used unoptimized networks and systems. 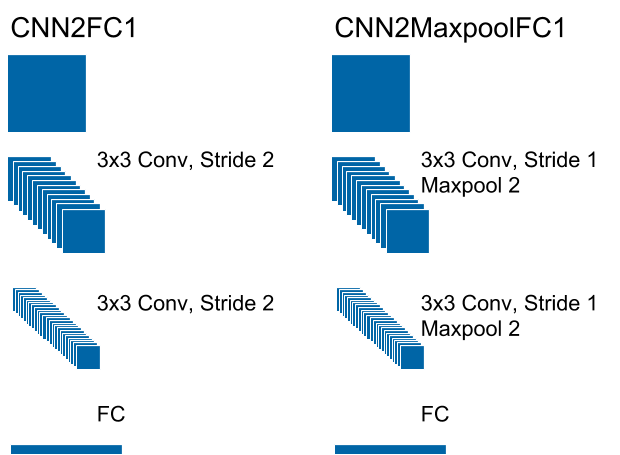 CNN3: This is a fully convolutional neural network, using only convolutional layers. 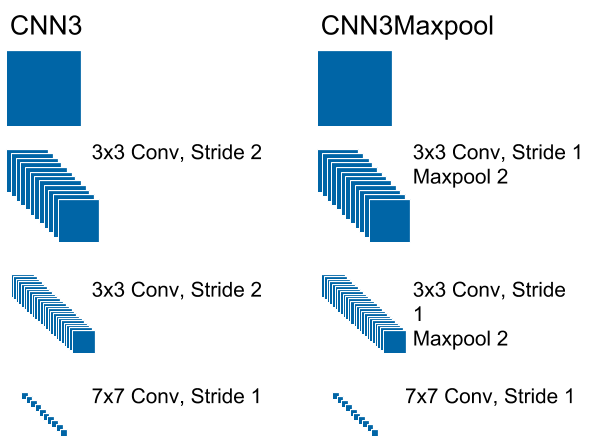 Instead of using maxpool-layers a stride size of two is used to decrease size (the stride size defines the pixel shift of the convolution filter). CNN3Maxpool: The effect of maxpool on the performance is shown by comparing the previously described network to the same version, utilizing maxpool instead of stride sizes higher than one. CNN2FC1 and CNN2MaxpoolFC1: A third and fourth comparison can be made when replacing the last layer of the two previous networks with a fully connected layer. This allows more flexibility for the network for the input size of the image. We have developed a simple software to show how a custom keras model can be automatically translated into c-code. The generated c-code can, in combination with the ARM-CMSIS-NN functions, be used to run neural-net calculations in an efficient way on an embedded micro-controller such as the CORTEX-M4. The example software on GitHub has also firmware which runs on the STM32F4-Discorevy Board. Part of the firmware was generated with cubeMX. The example software has a MNIST classifier which can classify handwritten digits. See https://github.com/InES-HPMM/k2arm for more Details. The HDMI2CSI board for capturing 4K HDMI was ported to the latest release of L4T (28.2.1) including the bug fix in the Nvidia VI (see forum: , ). Major differences where adapted from L4T 28.1 to L4T 28.2.1 and our developed hardware is again able to capture 2160p30. Run the tc358840 outside its specification (>1Gbps) you could also capture 2160p60. Grab the newest version on Github. If you are running into problems capturing after a format change restart your application. Currently the Nvidia VI does not recover from an error, namely PXL_SOF syncpt timeout. Embedded devices like the Nvidia Tegra X1/2 offer tremendous video processing capabilities. But often there are bottlenecks hindering you from taking advantage of their full potential. One solution to this problem is to employ the general purpose compute capabilities of the GPU (GPGPU). For this purpose, we have developed a GStreamer Plug-In that lets you add a customized video processing functionality to any pipeline with full GPU support. A possible application is shown in the image below. Two video inputs are combined to a single video output as a picture-in-picture video stream. A 4k image is depicted in the background and on top of it a downscaled FullHD input is streamed. In order to cope with the huge amount of data, the video processing is outsourced to the GPU. The use of CUDA allows you to create new algorithms from scratch or integrate existing libraries. The plugin enables you to benefit of the unique architecture of the TX1/2, where CPU and GPU share access to the same memory. Therefore, memory access time is reduced and unnecessary copies are avoided. The next image shows a pipeline of the example mentioned above. At the beginning of the pipeline, where the data rates are the highest, the GPU and internal Hardware encoders are used. The CPU can then handle the compressed data easily and gives access to the huge number of existing GStreamer Plug-Ins. For example it is capable of preparing a live video stream for clients. The GStreamer Plug-In can also serve as a basis for other applications like format conversion, debayering or video filters. Feel free to contact us on this topic. 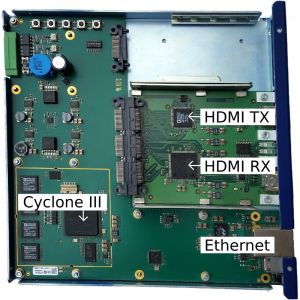 The HDMI2CSI board for capturing 4K HDMI now supports both TX1 and TX2. Video capturing is fully supported for resolutions up to 2160p30 on Input A and 1080p60 on Input B.
Driver development will continue on L4T 28.1. The previous 24.2.1 branch is considered deprecated. If you want to use Userptr/Dmabuf mode in GStreamer v4l2src, you still need to rebuild GStreamer. The reason is that GStreamer by default uses libv4l for the REQBUF ioctl. The libv4l implementation of this ioctl does NOT support userptr/dmabuf. But you can just build GStreamer without libv4l and it will use correct implementations for the ioctls and work. 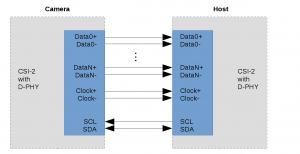 Modern SoC devices offer high performance for data analysis and processing. In order to transfer accordingly high data rates, the choices for high speed general purpose interfaces are limited. The first that comes to mind is PCIe, which is available in most high performance SoCs. However, PCIe requires a relatively complex controller on both data source and sink. Additionally the fact that PCIe is such a commonly used interface means that all of the SoCs PCIe controllers may already be occupied by peripherals. Coming from the mobile market, some SoCs additionally offer MIPI Camera Serial Interface (CSI) / Display Serial Interface (DSI)  interfaces, for example the Nvidia Tegra K1 / X1 or Qualcomm Snapdragon 820. These interfaces were designed for high bandwidth video input (CSI) and output (DSI). These state-of-the-art SoCs provide CSI-2 D-PHY interfaces which can have a transmission rate of 1.5 to 2.5 Gbps/lane. One such interface consists of a maximum of 4 data lanes and one clock lane. Typically, one to three interfaces are available, allowing to connect up to six different devices (depending on the SoC model). Instead of restricting the use of the CSI/DSI interfaces to video only, we propose to use them for transferring general purpose data. 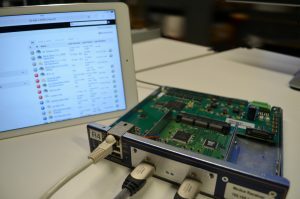 The theoretical maximum bandwidth of such an implementation is 30 Gbps (using 3 4-lane MIPI CSI/DSI interfaces). For a data acquisition application, a sampling rate of 1.875 GSps can be handled. A comparable PCIe x4 v2 interface provides a maximum throughput of 16Gbps, resulting in 1 GSps sampling rate. We successfully implemented and tested digital audio data transmission over CSI/DSI and will continue to explore this interesting interface. For our test driven way of development we build up a regression test system for our high performance video and audio transmission. The system is used to schedule and run tests and monitor the results in real time. For this, it provides a wide range of interfaces to interact with the system under test. This includes interfaces to monitor and manipulate the network traffic as well as interfaces to generate and analyse video and audio signals. The system is based on a Linux OS and can therefore be used on many different hardware platforms. The tests to be run are written in Python and can be run automatically or manually. An interface to Jenkins allows to combine the test system with the build flow. With regression tests is the system tested with a large number of test cases. Some of the cases are based on the expected behavior of the system. Some cases are based on reports from customers and partners. Before a new software is released it has to pass all this test cases. Like this, each release provides at least as good as the last one and the software will continuously improve with each release. The InES regression test system provides an interface to Jenkins. This allows to include the tests directly into the build flow. The newest software can be built and downloaded to the target system. Which is then tested with all the regression test cases. The Jenkins web interface allows the user always to see the current progress as well as to change or interrupt some steps if required. The InES regression test systems provides the required interfaces to the device under test as well as the tools to schedule and execute the tests. The user just has to describe the test cases in Python. The test system can be set up on a PC or embedded system. It is also possible to split the test system over multiple platforms. The regression test system is built up modular. It’s possible to deactivate unused interfaces to reduce the requirements for the platform. It is also possible to add new interfaces specifically adapted to the device under test. Like this, it’s possible to adapt the test system perfectly to the device under test as well as to the platform it runs on. The High-Performance Multimedia Group has developed an HDMI Real-Time Analyzer and Tester which allows logging and real-time modifications of the HDMI stream between source and sink. Real-time modification of HDMI communication-stream, such as corrupting or delaying the responses of HDMI devices. 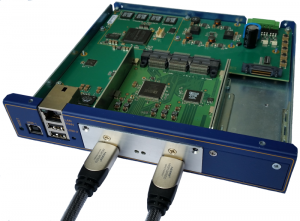 The HDMI Real-Time Analyzer and Tester is implemented on an Altera FPGA with NIOS II softcore processor running Linux. The device taps into the DDC channel to allow logging and modifying the communication in real-time according to user-defined behavior rules. The driver supports standard device tree and currently runs on the Linux4Tegra (L4T) R24.1 operating system. The video stream can be accessed from user space using GStreamer, the versatile multimedia framework. Meet us at the Embedded Computing Conference on May 31st on the Campus of ZHAW School of Engineering, Technikumstrasse 9, 8401 Winterthur. We are presenting new technology highlights based on embedded processors with integrated GPU.